Life does that- it takes away internet time, even when there is TONS to post about. So Cello went down to Justin Dunn’s a few weeks ago for training. I was super excited that Justin was going to work with him, and I have not been disappointed. They are getting along wonderfully. Getting off to Justin’s was a rough start- Cello would NOT load up into our 2 horse straight load. He walked into it once for some hay, but must have decided it wasn’t worth it, because when it came time to go the first Friday of the month it was a solid NO. We tried for hours on Friday night and all day Saturday. We tried the circles, sending him in, pressure and release, even resorted to tempting him with food. Loaded his miniature buddy in and let her chow down while he considered striking the trailer. One hoof in, and then that was it. Justin had to come grab Cello himself later that week. He showed up with a huge stock trailer, which Cello practically walked right into. Cello didn’t know how to give to pressure, and coming from an English background I did not know how to teach that really. I knew how to make him disengage his hindquarters and that was about it. All the young horses I worked with before Cello were raised in barns, had shown & trailered maybe 6 times by the time they were weaned, began in-hand work as yearlings, maybe lunging as a two year old, long lining as a three year old, and then between three or four you finally ride… at that point with built in steering essentially and brakes! Completely different style than what this little mustang needed/knows. Round penning at Justin’s this weekend was really funny. Cello did great with him, but the techniques were so different to me that I kept getting my signals confused. For instance, with the dressage horses, you don’t lunge in an even circle, you travel around. It’s better on their joints, because lunging is a workout or pre-workout in that discipline. With the mustangs, it’s a training tool, actually teaching something. With the dressage horses, they stop on the circle, they are trained to NOT turn into you ever. To switch directions you approach their heads and manually turn them, and you probably have to adjust side reins and things. With mustang roundpenning, you change directions at the gait you are working in, with the horse turning in towards you, focused on you, and without your feet travelling. I was a mess at this! Cello has quite the day with Justin when it’s a training day. He starts out in the round pen at Justin’s house, gets saddled, then trailered to an arena for a workout, then trailered to another ranch for a cool-down. Lots of trailering and location changing. At one arena we were invited back to volunteer with a Cancer Camp after the owner heard we were doing therapeutic riding! I can’t wait to volunteer there this summer, it will be such good exposure for both of us. Justin has Cello flexing well and really giving in to pressure. Cello is cantering on both leads- something I had difficulty maintaining with him. I didn’t ride this weekend but plan on riding him next week sometime, and making it out there another weekend while he’s still in training. I’m trying to learn as much of this natural horsemanship stuff as I can. Finally picked out a western saddle I want for Cello, and I’m going to plan on picking up a dressage saddle as well in the next 6 months. I like my all-around, but I really enjoy riding in a dressage saddle, and for kids/therapy I think a western is definitely needed. Oh yeah- the light gray is a 2012 EMM Ft. Collins adoptee, too, Moonshine. Justin brought him home for his wifey. 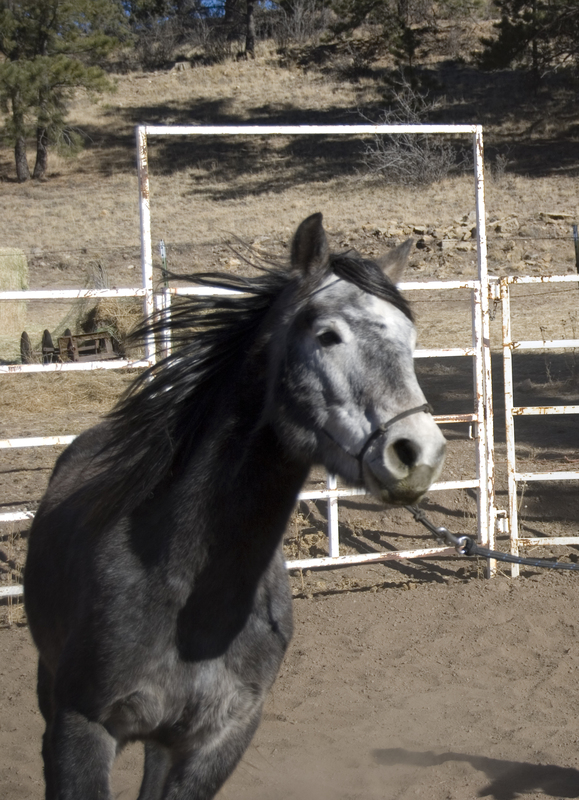 Cello & Moonshine met when they were both in training prior to the competition at a Westeraires event, then they met again at the competition, and now they are in a pen together bacheloring out! This entry was posted in Uncategorized and tagged Blm mustang, Cello, Dani Neumann, Extreme Mustang Makeover, justin dunn, skylark therapeutic riding, wild horse project. Bookmark the permalink. Yes the light gray is a blm mustang, i am not sure where he is from. I misplaced the program from this year that had all the info. I dont think any of the horses at the fort collins event were from Oregon, though I could be wrong. Did you adopt yours from a BLM facility or event?